Will sell for a fraction of what they could be worth. Furthermore, you need to know why the probability of you selling your business is decreasing! This enhanced eBook starts by discussing a terrible problem that keeps repeating itself time and time again. Included is a list of valuable resources specific to selling a business. The purpose of this enhanced eBook is to show you what an incredible opportunity selling your business really is - but you have to do it the right way or the consequences will be heartbreaking. It is also designed to show you that you are going to need some expert help and guidance throughout every step of the business preparation and selling process. This enhanced eBook can be played as a video or played as an audio file. For further details the eBook curriculum is detailed below. 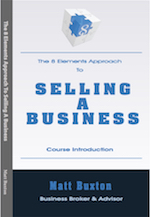 This enhanced eBook is the introduction to my complete selling a business course - The 8 Elements Approach To Selling A Business - only AVAILABLE HERE. It’s the reason I created a library of free resources specific to buying or selling a business. (See https://8-elements.com). My name is Matthew Buxton. I've been through the business buying and selling process hundreds of times and I’m passionate about teaching people how to buy and sell businesses. Why I Created The Course "The 8 Elements Approach To Selling A Business"